Coming up on Saturday, February 14, we're hosting Family Life's "The Art of Marriage" video conference. We'll start at 9:00am and go until 9:00pm. The cost is $60 per couple and that covers all of your materials and meals, including a nice dinner catered by Ray's Apple Mart. You may register online (there's a link to the right) or by calling the church at (785) 762-4404. Space is limited, so register soon! Watch the following trailer and please share it with others. A reminder that our offices will be closed the rest of the week in observance of the Christmas holiday. But we hope to see you back in church, bright and early on Sunday morning as we have two more weeks in our series through 2 Timothy! The title of this week's sermon is Fight the Good Fight from 2 Timothy 4:1-8. Please plan on joining us! Our Christmas Eve candlelight service is tonight at 6:00. We'll sing Christmas carols, hear a short message from Pastor Gabriel, and then head downstairs for some cookies and punch! The service should be over before 7:00. An offering will be taken. Come join us, and Merry Christmas! 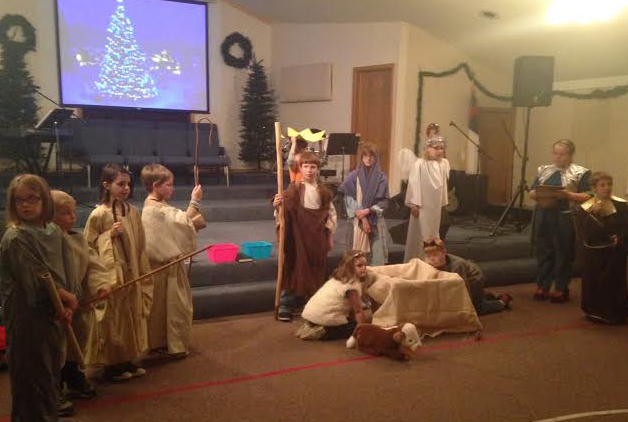 At AWANA tonight, our last AWANA for 2014, the kids put on a little Christmas pageant. Below is a picture of our manger scene! Next week, we will not have our regular Wednesday night activities. Instead, we'll be having a Christmas Eve service which begins at 6:00 and will finish up by 7:00. Be sure to bring some cookies for our get-together in the fellowship hall afterward! 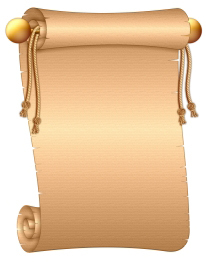 At our members meeting this past Sunday, our new constitution was reviewed and unanimously accepted, and will go into effect on January 1, 2015. Part of the restructuring of the constitution (also referred to as "Confessions of Faith") was to establish an eldership within the church. It is the first time in its 60 year history the church will appoint a plurality of elders. You can read the COF for yourself under the new "About" section on our website! Praise the Lord, and may we continue to serve as a church body in faithfulness. There will be no Women's Bible study this evening, typically meeting Sunday nights at 6:30. The rest of this weeks events will proceed as usual. Don't forget to follow us on Twitter for the latest updates, or "Like" our page on Facebook. Hey, don't forget -- our holiday potluck is this Sunday, starting at about 12:15 when second service finishes up. We'll meet downstairs in the fellowship hall for some good food. Please plan on joining us! Afterward, we'll have our members meeting to approve the new constitution for the church. Anyone is welcome to attend. If you're a member, your vote and your input matter.